John Lanchbery the original conductor is unable to stage due to his physical conduction. Therefore Alan Barker (Music Director, Scottish Ballet) will take the place of him. The theatre opens 60 minutes before the curtain rises. Available from Saturday 18 November, 2000 at 10:00am. Seat Z(¥1,500) is sold only on the performance day at the Box Office and a part of Ticket Pia Offices. There is the world's most beautiful magic here. From Charles Perrault's fairy tale, Cinderella is loved by people all over the world. The story of Cinderella, who is always cheerful and kind despite her adversity, is not just a fairy tale but it also gives us dreams and hope today. 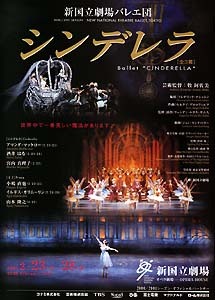 In December 1999, the New National Theatre, Tokyo (NNTT) gave its first performance of Cinderella based on the version by Frederick Ashton, the choreographer representing the United Kingdom. Ashton's delightful choreography completely blended with Sergei Prokofiev's colorful music. Together with the gorgeous stage art design, the sequence of beautiful scenes that inspired the admiration of the audience, met with great public response, making it a hit in NNTT's ballet repertoire. Furthermore, the malicious acts of the step-sisters played by male dancers rendered them comic characters that could not be despised, making the performance even more exciting, and these characters gained the popularity comparable to that of the title role. Following the previous season, the same version of Cinderella will be presented again in early 2001. Three pairs of highly individualistic dancers who play the leading roles as well as other dancers will even more skillfully execute the complicated steps designed by Ashton. This is a ballet performance presented by NNTT which should not be missed. A bit of magic turns a pumpkin into a splendid carriage and Cinderella's shabby clothes into a dazzling gown. With the spell, which a fairy puts on Cinderella, you are certain to feel happy.